Re-staining wood and maintaining outdoor decking can be a difficult process. 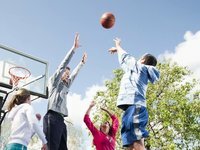 Lake Shore Sport Court can provide you with a beautiful deck for your outdoor living space. Wood on your deck can lose its color, chip and crack. 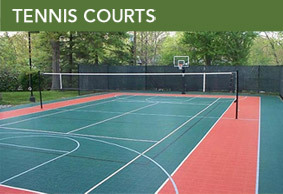 Sport Court deck designs are made out of quality products that are UV resistant and colorfast so they won’t fade. Our decking can even be installed right over existing decking, or be used to cover damaged concrete. Our decking even feels great when walking on it with your bare feet. Your favorite ride deserves a place to call home. Lake Shore Sport Court’s garage flooring surfaces deliver a showroom look to your garage, in a variety of colors and surface styles. Our MotorMat, SportTread, and Circle tiles come in a variety of colors which can be mixed and matched to create a classic showplace for your vehicles. Our garage flooring is fade-resistant and resistant to petroleum products, and is easy to sweep or spray out when cleaning is necessary.